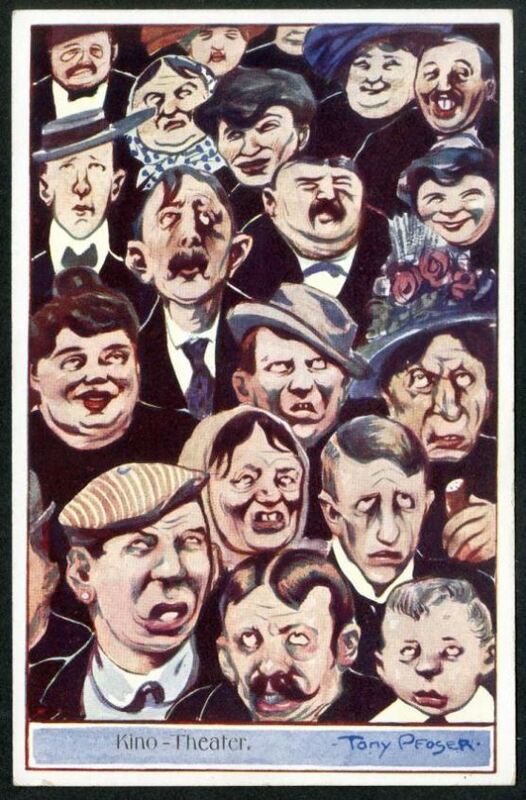 Comments: Tony Pfoser was an Austrian (or possibly German) caricaturist. 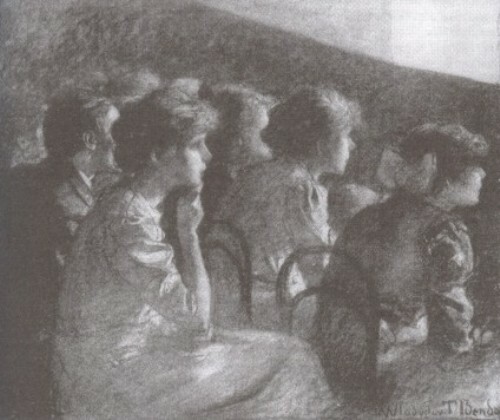 The postcard, which was printed in Austria, shows a cinema audience from the screen’s point of view. This entry was posted in 1910s, Austria-Hungary, Postcards and tagged Audiences, Tony Pfoser. Bookmark the permalink. As a projectionist in the 1970s, I once had a curtain motor failure and had to hand-wind the curtains closed from the side of the screen (hidden from the audience) while my co-projectionist took care of the projector. It was in the huge New Victoria in London. I took my position early, just as had Snow White apparently died and was in her glass coffin being attended by the grieving dwarfs. I shall never forget the view of hundreds of distraught children, mouths open and faces illuminated by the reflected light from the screen, and with tears streaming down their cheeks. It’s fascinating to see the degree to which the artist has made this is a screen’s eye-view of the audience, with those nearest the front looking up – and apparently less happy with what they see than those seated behind. There’s a Purple Rose of Cairo-style film that could be made of how those on the screen view the audience watching them. It’s the everyday stuff of theatre, but strange to contemplate when cinema.